If you feel blocked or just feel like something is not right you can do this little five day reversal. 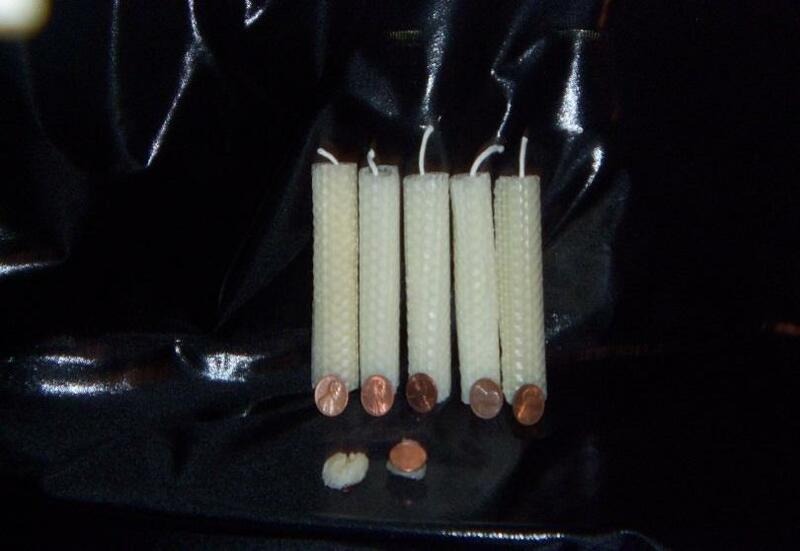 As you can see from the photo you need five pennies and five hand rolled bee’s wax candles. Roll your candles away from yourself when you are making them. Do not add anything to these candles. Make sure you do this when the clock is moving downward to remove. While you are rolling the candle call on the Trinity, your ancestors and St. Peter to remove all blocks. Once you have the candle rolled take the candle and while praying to The Trinity, your Ancestors and St. Peter wipe yourself going downward from head to toe. Then take one of the pennies and wipe yourself down with the penny. Turn the penny face down and burn your candle on it; once the candle has gone out as shown in the photo mash the left over wax on the penny. Set the penny aside on the plate and the next day repeat the instruction until you have burned all five candles. On the sixth day take the pennies and throw them in the crossroads that is away from your home. Light a white vigil to the Trinity, your Ancestors and St.Peter thanking them for their assistance.